Still up in the air about your Halloween costume, but want to make sure you’re not one of 10,000 Donald Trumps wandering around NYC on Saturday? 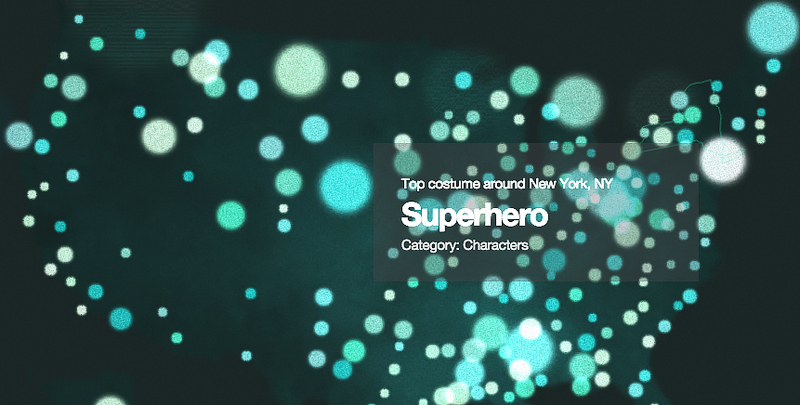 Check out this cool map called Frightgeist that shows what the most popular costumes are in cities across the country. Using Google Trends, the map from Google News Lab pulled the top 500 costume searches to create this handy national- and local-based resource. The top five costumes in the country, in order, are Harley Quinn, “Star Wars,” superhero, pirate, and Batman (not very original, America). In the city it’s superhero; generally, in the Northeast, most cities are on track with the national trends. There are some interesting choices, though. In Lancaster, Pennsylvania the most popular costume is 1980s; in Twin Falls, Idaho it’s Tinker Bell; in Palm Springs, California it’s the Addams Family; in Greenville, Mississippi it’s a nerd; and in Billings, Montana it’s dinosaur. Oh, and as for Donald Trump, he’s all the way down at #105 on the national list.